Making her first visit to the Clyde, Cunard's latest cruise ship QUEEN ELIZABETH is seen above making her way upriver past Dunoon to Greenock Ocean Terminal. 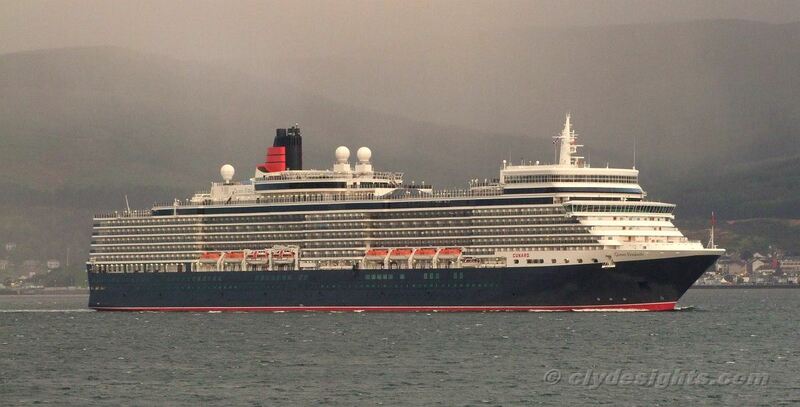 QUEEN ELIZABETH is slightly larger than her close sister QUEEN VICTORIA, which visited Greenock in July 2010. As she has a slightly different layout her tonnage is 90,901 gross tons. As QUEEN ELIZABETH made her way upriver, she passed another passenger ship, PRINSENDAM, which had lain overnight at Greenock. The pair exchanged greetings as they passed one another, both being owned by a subsidiary of the Carnival Corporation. QUEEN ELIZABETH was launched in January 2010 and completed in October at the Fincantieri Molfalcone shipyard in Italy. She was named by Her Majesty the Queen at Southampton, her home port, on 11 October 2010 before setting out on a cruise to the Canary Islands. 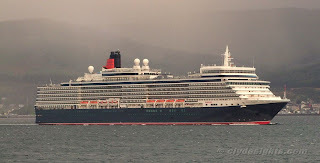 Although several cruise ship have left Greenock and taken the Hunterston Channel on their way downriver, the departure of QUEEN ELIZABETH was unusual as it was probably the first time that a Cunard ship has done so. The last view shows her catching the evening sun as she heads towards Largs.